With Good word of mouth that is being spread amidst the audiences who’ve seen Lakshmi’s NTR, the movie is doing pretty well in the overseas. Especially in USA, the film has grossed $250K+ in its opening weekend. The movie is already at No.4among the list of top grossers in the USA among all Telugu releases in 2019!!! It will end up as a profitable venture for the distributors. To facilitate a happy viewing for the audience across USA, we are giving you a heads up on special offers you could avail to watch the film. Cinemark Movie Club: New and existing members can watch this movie by paying the monthly subscription of $8.99. 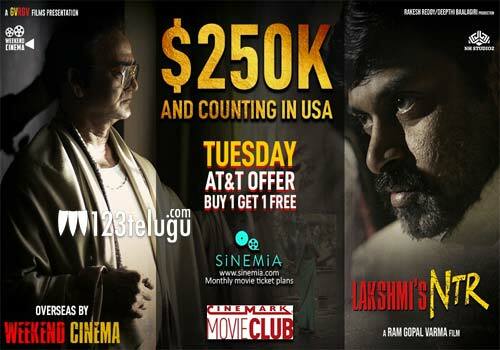 Well, its time to get your hands on those tickets to check out “Lakshmi’s NTR” from ace director RGV which is registering sensational collections in USA.